As most Colorado gardeners know, the first step to growing strong and healthy vegetables is to have good soil; and the first step to having healthy soil is to add organic matter by way of compost. While there are many sources for purchasing finished compost, creating your own compost is often a more rewarding alternative that will allow you to divert plant material from the waste stream (compostable materials comprise a staggering one-fifth of all waste in landfills in the United States) and will improve your overall soil quality. An active compost pile is a 2:3 mixture of inputs high in nitrogen to inputs high in carbon. The nitrogen inputs, or “greens”, are things like non-dairy/meat food scraps, coffee grounds, weeds and trimmings from your vegetable or perennial plants, and pet/human hair. The carbon inputs, or “browns,” are things like newspapers, straw, dried leaves, branches, and egg cartons. By maintaining the 2:3 ratio, chopping items into small pieces when adding to the pile, monitoring your pile for appropriate size and moisture content, and occasionally turning the pile, your scraps will be transformed into finished compost in as little as six weeks. When the compost is finished, the pile will be about half the original size. Finished compost can be tilled directly into new garden beds or it can be used as a top dressing throughout the season. In addition to improving soil tilth (the ability to promote plant growth), compost also serves as a fertilizer and can provide nutrients to outdoor gardens and indoor potted plants alike. Learn more about composting methods at Brien’s class, Composting Revealed – Creating a Healthy Soil Base for Your Garden on Saturday, June 1 from 2 – 6 p.m. at our Chatfield location. Discover the science and benefits of compost, as well as how-to's for backyard piles and indoor vermiculite bins. Participants will leave this class with the skills and comfort level necessary to build and maintain a successful compost pile in a Colorado climate. Brien has been with Denver Botanic Gardens for four years working in the greenhouses and as the manager of the Community Garden at Congress Park. 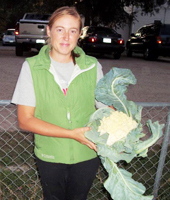 Before coming to the Gardens, Brien was a farm manager for an organic vegetable farm in Boulder, CO. Brien is currently very active in the promotion of urban agriculture throughout the Denver area and serves on the Board of Directors for the American Community Gardening Association.